“My goal is to provoke some thought, stir some ideas and discussion; I think that’s where I can add the most value,” said Jeff Simmons, President of Elanco, in his opening remarks to a joint session of the NAMA 2011 “Trends in Agriculture” conference and the NAFB 68th Annual Convention. The session, “Productivity to Feed a Growing Population,” was the culmination of a series of strategic perspectives examining current trends and opportunities in agri-marketing. “Progress through Productivity” was the theme of this year’s conference, attended by agribusiness leaders from across the country. Like Simmons, several of the presenters challenged attendees to examine their own role in advancing the industry. Experts in alternative fuels examined advances in technology and explored possible pricing pressures that could result from reduced support incentives combined with the growing global demands for grain. And a panel of producers shared their perspectives on how to increase productivity, whether in the field or in the feedlot … as well as the consequences of increasingly competitive grain availability. “My focus has been on risk management,” said Terry Jones, who owns and operates Circle J Grain, a grain origination and transportation business with operations in the U.S. and Brazil. J.D. Alexander, owner of Alexander Cattle & Farms and current President-Elect of the National Cattlemen’s Association, reinforced that approach. Alexander also underscored the reason these business leaders had gathered to examine strategic issues. 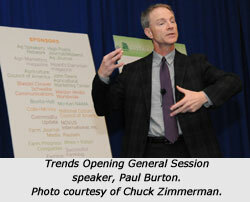 View photo’s from the 2011 Trends In Agriculture fall meeting on Flickr. Photo’s courtesy of Chuck Zimmerman, ZimmComm New Media LLC (www.agwired.com). 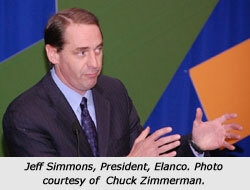 View the Trends In Ag presentation by Jeff Simmons, President, Elanco, on YouTube at http://tinyurl.com/7uy9zjc. NAMA honored four recipients of the 2011 Professional Development Awards of Excellence at the 2011 Trends In Agriculture fall meeting on November 9. These awards honor NAMA members based on outstanding achievement in the professional development areas. This year, Awards of Excellence were presented in the areas of marketing communications, public relations, product/species management and sales. Margaret Fogarty joined Farm Credit almost exactly 18 months ago, and her accomplishments during her tenure have had a truly profound impact on the organization and the industry. Margaret and her team built a comprehensive, integrated marketing communications program to introduce a collective national brand and unify reputation management efforts in the Farm Credit System. In doing so, she introduced and implemented dozens of new concepts with more than 90 Farm Credit System entities that had nearly a century-long legacy of local, disparate brand-building. Frequently presented with diverse (and often outdated) technical capabilities, geographical dispersion, varying business philosophies and styles of communication, Fogarty executed an integrated strategic communications program that encompassed corporate brand identity, internal communications, online communications, public and media relations and national contributions. Margaret is more than an active member of NAMA; she is also a leader and educator. As soon as Fogarty joined the ag industry, she became a NAMA member and attended the 2010 annual conference. She valued what she learned through her membership and wanted to give back, so she created opportunities within NAMA to connect peers and Farm Credit associations, as well as to ensure that Farm Credit was a strong financial supporter of NAMA. Ms. Fogarty embraced the 2010 conference opportunity by implementing 2011 Idea Share NAMA Pre-Conference, Farm Credit’s first systemwide internal communications conference, to coincide with the NAMA event and collaborated with NAMA organizers to ensure all Farm Credit efforts were complementary and supportive of NAMA activities. From on-line photo album development for key industry events, to news reporting and media liaison activities for various commercial clients, to ‘blogging’ his way across the land, Chuck has become a common sight at just about any type of meeting or event in the agriculture industry. He has also done a great deal to get many others involved in new media endeavors. ZimmComm’s primary website, www.AgWired.com, continues to grow in web traffic and involvement by industry professionals and agriculturists alike. He regularly crisscrosses the country from one event to the next, hired by PR professionals and companies of all types and sizes to perform a specific but expanding list of New Media, Social Media and related Public Relations services. As part of the ZimmComm, Inc. business model, Chuck has developed numerous websites, some of which are focused on one commodity or industry enterprise. Some have become very viable website “channels” for a specific industry purpose. Some of these websites are owned by ZimmComm, Inc. and others are built and maintained by ZimmComm on a contractual basis for their clients. Many of these website concepts were born out of brainstorming about a specific challenge or need in the industry, and then developing a web presence to serve that need. Chuck has been active in NAMA throughout his career and he continues his membership in a very active way now in his role representing his own company, ZimmComm, Inc. He has given countless hours and days to NAMA service in many, many ways over the years. He has always been active in his local chapters, and has been involved in program planning and leadership at local levels. He is currently a nominee to the Executive Committee. Product/Species Management ~ Stephanie Gable, NOVUS International, Inc. Since September, 2008, Stephanie Gable has worked as the Global Ruminant Market Manager for Novus International in St. Louis, Missouri. She is responsible for developing marketing strategies and plans to reach their dairy and beef customers in six world areas including the United States, Mexico, Brazil, China, Australia and Europe. Stephanie has always been in charge of the marketing for the Beef and Dairy segment, but this year she has taken on additional responsibilities with Pork and the General Feed Line businesses at Novus. Stephanie’s business sense and get it done attitude has helped build awareness and support for the sales teams of these four segments. Stephanie will be a co-author on her first scientific article. Prior to joining Novus, Stephanie was the Companion Animal Pharmaceutical Product Manager for Fort Dodge Animal Health near Kansas City, Missouri, where she re-launched a canine heartworm product. She also worked as the Strategic Initiative Product Manager and initiated livestock, equine and companion animal programs and rebates. Previously, Stephanie was the communications manager for Bayer CropScience in Durham, North Carolina. Her overall responsibility was as the key client contact with their communications agencies in all markets including corn, cereals, cotton and horticulture. She was accountable for developing effective communications plans that were strategic and measurable. Stephanie has taken several steps to not only grow herself through organizations like NAMA, but she has also taken the time to develop her staff into professional agri-business employees that will make a difference. In addition, Stephanie has been involved in NAMA on every level; local and national. She served for many years on the Careers Committee and then as a member of the executive committee for seven years. She currently serves on the Agri-Business Educational Foundation Operating Committee. Sue is the national sales manager for Farm Journal Media – no small task in itself, considering the number of properties the company has to ‘sell.’ Sue does an excellent job of networking and meeting individually with clients and potential clients before, during and after trade shows and other industry gatherings, and has a tremendous ability to communicate with any type of personality. Without being pushy, Sue really gets to know clients and their needs before trying to jump them with the sales pitch. Sue takes her job seriously, but she obviously loves her work, too. She is a strong example of what NAMA stands for in terms of integrity, opportunity, and down-right respect for agriculture and those who pour their hearts into it on a daily basis. And Sue has put her passion to work directly for NAMA in so many ways. At the chapter level, she has served as president, Best of NAMA chair, secretary, treasurer, program chair, Agri-Marketer of the Year chair, careers chair, and membership chair. And at the national level, she has served as National Continuing Education co-chair, as a member of the Agribusiness Forum national committee, and as a regional director – and currently serves on the national membership committee. The 2012 Agri-Marketing Conference planning is underway and it’s time to sign up to be an Exhibitor in the Connection Point! The conference will be held April 18-20, 2012 at the Sheraton Hotel at Crown Center (formerly the Hyatt Regency Crown Center). The social epicenter of the conference, the Connection Point is the place to meet new faces, reconnect with old friends and forge new relationships. Schedule plenty of time in your conference plan to visit the over 60 exhibiting companies and mingle with industry leaders. You’ll get a first look at the latest products and services entering the industry. Plus, most booths host drawings for door prizes and other giveaways. Expand your network, peruse new technology and services and win cool stuff—see you there. The Connection Point will be open Wednesday, April 18 from 6:00–7:30 p.m., Thursday, April 19 from 12:30–2:00 p.m., 3:00–4:00 p.m. and 5:00–7:00 p.m.
Booth space price (10’ x 10’ space) is $475 (includes one exhibit hall only pass). Trade in your exhibit hall only pass and receive $100 off one full conference registration. Additional exhibit hall only passes are $250 with a maximum of two per booth space. To sign up for a booth in the Connection Point, visit http://www.nama.org/amc/ts/signup.htm or contact Jenny Pickett at jennyp@nama.org or call 913-491-6500. In a late afternoon gathering, Iowa NAMA Chapter members and guests gathered at Jasper Winery in downtown Des Moines on October 27, to hear a presentation made by Chocolate Storybook owner, Steve Shearer, and enjoy a wine tasting. Steve Shearer’s Des Moines based company, Chocolate Storybook, specializes in not only chocolate, but corporate and personalized gifts. Attendees were able to view and enjoy various gift ideas for clients, partner companies and employees. 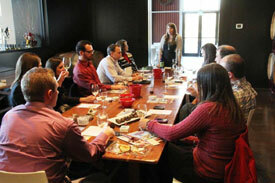 The remaining portion of the event was entertained with a wine tasting of Jasper Winery selections. Those attending shared in some laughs as they were taught how to properly swirl, smell and select wines. Information was also shared with the group about the operations of the Jasper Winery and how their marketing is coordinated with minimal staff. This was an enjoyable afternoon event for members and guests. Please consider attending the next Iowa NAMA Chapter social event! Exhibitors at the FFA Convention in Indianapolis appreciated the opportunity on October 20 to attend a reception hosted by the Mid-America NAMA Chapter. It gave them a chance to sit down and relax while enjoying food and drink. 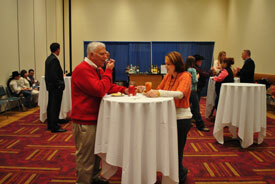 Exhibitors from all over the US took advantage of being able to network and relax at the end of a long day. With a changing environment for animal agriculture, the October 20th North Central NAMA event featured Rick Berman, founder of HumaneWatch.org and Center for Consumer Freedom, sharing his unique insight. Nearly 60 NAMA members and Minnesota agribusiness leaders attended this event at the University of Minnesota Alumni Center. This experienced lobbyist also said that it is important to create common knowledge. He explained that common knowledge is created by sharing the information in so many different ways and with such frequency that people begin quoting the information without always citing a source. Berman admitted it is easier for a group like HumaneWatch.org to use criticism as a tactic than for an agribusiness company or producer organization. He did say that all of agriculture needs to be consistent in calling out inaccuracies in media reports, news articles and letters to the editor. “You can’t just hit it occasionally—you have to be consistent,” emphasized Berman. The Southwest NAMA Chapter hosted NAMA Day at the State Fair of Texas on October 11. 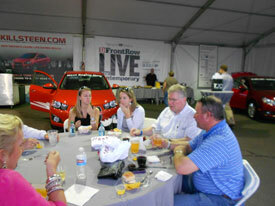 Chevrolet and the Chapter invited NAMA members to a VIP event in Chevy Town Square at the Fair. The event kicked off with the opportunity to test drive cars that many of the State Fair public didn’t have access to, including Camaro Convertible, Cruze Eco, Silverado 2500 HD, Sonic, and their new electric car – the Volt. Following the test drives, attendees enjoyed food and drink while listening to Chevy representatives share information about their program that takes cars to public events, allowing consumers to become more familiar with their cars without the pressure of test driving in a retail environment. Charleston/Orwig Kickstarts ABEF VISION2020; First to Contribute to A.S.A.P. The Agri-Business Educational Foundation, a 501(c)3 non-profit organization, is pleased to announce that Charleston/Orwig is the first to make a major contribution to the Foundation’s recently developed fundraising program targeting Ag advertising agencies — A.S.A.P. (Agencies Supporting ABEF Programs). The $5,000 initial gift will be used to help support ABEF college student scholarships, the National Student NAMA Marketing Competition, and other programs benefiting students and young professionals in ag marketing. “We’re very pleased to play a part in helping this Foundation that continues to support so many in the ag marketing industry,” said Lyle Orwig, Charleston/Orwig CEO. Agencies who sign up for A.S.A.P. follow certain guidelines in support of ABEF. In addition to an unrestricted gift to the Foundation ($500 to $100,000), agencies agree to provide information about ABEF to clients, employees, and suppliers, asking for their financial support of the Foundation. Agencies may also match employee contributions. “We’re challenging all other ag marketing and advertising agencies to join us with A.S.A.P. We truly need to develop the next leaders in ag. ABEF is great way to do so,” states Orwig. Interested agencies can get more information about ABEF and A.S.A.P. by contacting Michael Gustafson, Deer’s Landing Communications, at 217-251-3659 (guswriter@yahoo.com) or Jenny Pickett at the National Agri-Marketing Association (NAMA) office at 913-491-6500 (jennyp@nama.org). Established in 1991 by members of the National Agri-Marketing Association. ABEF – the Agribusiness Educational Foundation – is a 501(c))3 non-profit foundation with the mission to help provide financial support, learning opportunities, and professional networking experience to students and entry-level employees in marketing and communications for agri-business. We do this by working exclusively with and through the National Agri-Marketing Association (NAMA), the nation’s largest professional association for professionals in marketing and Agri-business. With our focus on NAMA and NAMA Student Chapters, we can provide college scholarships, financially support a national Student Marketing Competition, provide materials and seminars for leadership training, and offer support and guidance for internships, all with a primary focus on the business of agriculture. VISION2020 is a new initiative that seeks to raise up to $4 million over the next 10 years for college student scholarships, student and young professional development programs, and support of the National Agri-Marketing Association (NAMA) Student Program. Funding may also be made available for outreach to high school juniors and seniors, promoting careers in Ag business, marketing and communications. Much of American agriculture is dependent on international trade. What does this mean for the future if the ag industry in our country? NAMA Trends in Agriculture explored that issue with a panel that included Tom Dorr, the President and CEO of the U.S. Grains Council. 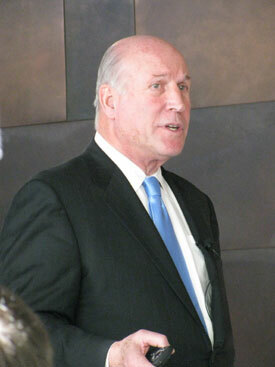 Dorr shared his thoughts on what solid export policy for the U.S. should look like. NAMA Trends in Agriculture examined that issue with a panel that included Dan Basse, President of AgResources, who talked about the state of export markets going forward. NAMA Trends in Agriculture also delved into that issue with a panel that included Bailey Ragan, Vice President, Grain, Biofuels and Fertilizer for Bunge North America, who talked about how the shape of U.S. infrastructure will determine progress and success in our export future.